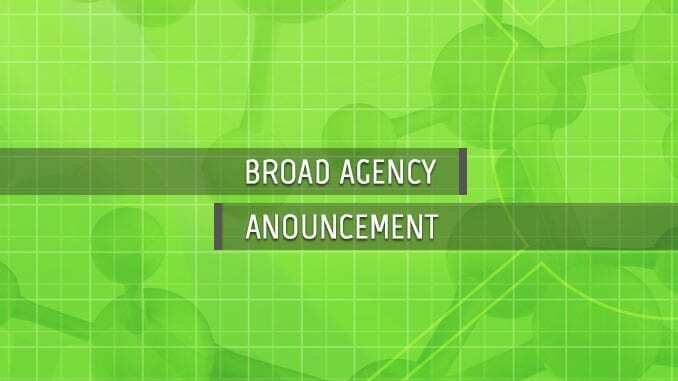 The Air Force Research Laboratory (AFRL) 711th Human Performance Wing, Human Effectiveness Directorate (711 HPW/RHP) is soliciting white papers under an annual Broad Agency Announcement (BAA) for innovative science and technology projects to support advanced bioscience research. The purpose of this BAA is to augment core research activities and facilities to provide radically new military capabilities that improve warfighter performance, protection, and survivability. Applications to identify, isolate, and characterize metabolic pathways involved in microbial pathogenesis, in order to develop better methods to neutralize Biological Warfare Agents and Weapons of Mass Destruction (BWA/WMD). Research to increase the capability to locate, identify, and track BWA/WMD. Research in biological, physical, and chemical technologies to determine the viability of BWA/WMD and increase the capability to neutralize them. Research to understand the effects of microorganisms on materials of interest to the Air Force and interactions between host organisms, antimicrobials, and materials. Synthetic biology and other aspects of cellular dynamics for systems engineering that capitalize on emerging developments in cognitive, biological, informational and nano sciences. Protein, metabolite and transcript identification techniques to isolate unique biomarker signatures after low-level and threshold exposure concerns of toxic compounds or stressors of cognitive performance. Transcriptomics, proteomics and metabonomics, and advanced bioinformatics applications to identify performance enhancement measures. Identification of phenotypic patterns to be used for the development, validation, and down-selection of predictive protein biomarkers of optimal mission-ready mental and physical states. Research in physical and physiological biosignatures, neuroscience, anthropometry, biomechanics, and human modeling to rapidly identify human threat conditions and sustain expand warfighter performance in stressful environments. The solicitation number is BAA-09-02-RH and is available in full here.